The articles are aimed at a technical audience of architects or developers. 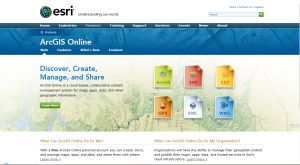 ArcGIS Online is a large collection of GIS capability and data. ArcGIS Online provides "Hosted" and "Content" web services, mobile and web application programming interfaces, web mapping explorer application for sharing and collaboration, ArcGIS integration and Excel integration. It offers broad range of capability with ESRI product suite wide integration and support for a wide range of development technologies.